Greg Grewal ’16 (Downingtown, Pa.) has been named the Patriot League Swimming and Diving Scholar-Athlete of the Year. A chemical engineering major, Grewal was named the Maroon Club Scholar-Athlete of the Year in November, an award given out to the top Lafayette male student-athlete for excellence in competition and in the classroom. Grewal was an EXCEL Scholar with Michael Senra, assistant professor of chemical engineering, and published research in an academic journal. Selected to the Academic All-League Team for a third-straight year, Grewal placed third at the Patriot League Championships in the 100 (53.89) and 200 breaststroke (1:57.97). 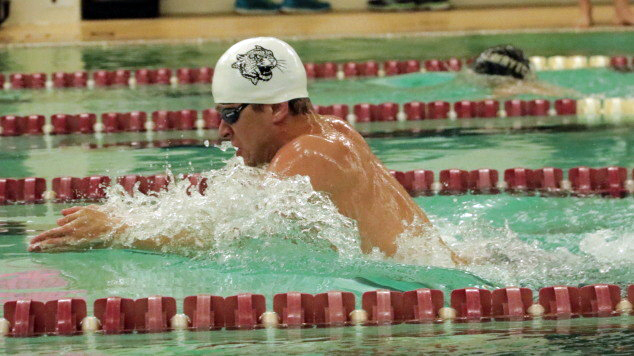 He also finished 14th in the 200 IM and earned All-Patriot League Second-Team status for a third-straight season. Grewal leaves Lafayette as the current record holder in four individual events (100 breast, 200 breast, 100 IM, 200 IM) and two relay events (200 & 400 medley relay). In late June, he’ll find himself in the place he’s been envisioning since he was a little boy: the U.S. Olympic Trials. He is the first Leopard to qualify for the Olympic Trials since 1992. Grewal will compete in the 100 breaststroke on June 26 in Omaha, Neb., in what will be a brand new pool built specifically for the trials. The Scholar-Athletes of the Year are voted on by the league’s swimming & diving sports information directors, who are not permitted to vote for their own students. The winners from each individual sport comprise the pool of nominees for the Patriot League Male and Female Scholar-Athlete of the Year awards given out over the summer. The Diffendalls are so very proud of you and your supportive parents. What an accomplishment. Congrats! Congratulations Greg! What an impressive and amazing journey you’ve had! Hard work, perseverance and a work ethic of excellence really does pay off!! Wishing you the very best with the next chapter in your book of life!